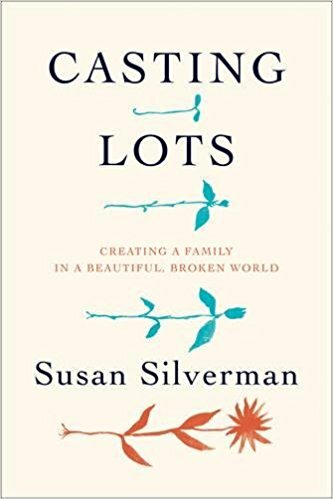 Review: Susan Silverman has certainly lived an interesting life, but I found I was interested in things left off the pages. I was specifically interested in her vocation as a Rabbi. She goes into detail how she went to rabbinical school on a whim, didn't even know what rabbis do...and then the entire thing is dropped. Did she ever work as a rabbi? I have no idea. I think her parents were fascinating and my heart broke for their tragic loss. As for Susan herself...I found her extremely annoying. She says they had no money (they had to take out a 2nd mortgage on their house to pay for one of the adoptions), yet her children all attending private school. She goes into great detail about her insistence of her first adopted son being accepted as an Orthodox Jew...yet never mentions a thing about her 2nd adopted son. She also made it seem like the 4yr old son they adopted seamlessly joined their family, I find it hard to believe there weren't any issues. One of her biological kids also seemed to have major issues (punching another child at school) and she brushed it off. Overall, an ok read and it was interesting to see how much easier adoption was in the 1990s compared to now, but not my cup of tea.